Another average movie. It had its moments but overall pretty average. The movie was just funny. All of the characters in the night school were funny and had issues. lol whoever wrote this is not for kids etc well NO SH!T !!! lol great movie, Love Chris Heart ! Wow this movie was very bad. Probably the worst movie Chris Hart has ever been in. Career killing almost. A light hearted comedy to escape reality for a little while. Not bad at all. Better than I expected. Support cast helped a lot. Was a Kevin Hart supporter, this is the worst movie that I have ever seen, walkout within 18 minutes of the beginning and get your refund. Tarran Killam, and the Teacher were the only redeeming Actor's. On the bright side...the new reclining seats are fantastic and this is still the best Theater around, many thanks. Easy going funny movie, enjoyable, no stress. The language was totally unnecessary. There were a few parts that were funny but not many. I usually like Kevin Hart but this definitely was NOT one of his best movies. I wouldn't recommend anyone to pay to see it. Wait for it to come out to rent or watch on TV. Really bad movie that appears to have been put together over someone's lunch break. And oh yeah, that last comment about how would a Muslim feel fit right into this movie, made no sense either. Bad. Very, very bad. Juvenile laughs for easily amused minds. Very funny! Kevin Hart does it again! You have to understand Kevin Hart's sense of humor to really connect with this movie. Well worth the money. I'm glad my guy took me to this for our movie date. Bad movie, not interesting, not funny. Stupid script, coarse language. This was so funny, uplifting and true in some aspects.. I laughed so much and truly enjoyed all the characters. I work for the school system. Disappointing, what has happened to you Kevin Hart ? This movie was funny and could have been a really good movie if had not been for the horrible bad laugage and sexually conduct! I just don’t understand why they have to use cuss words? Movie was funny; but most of the language was totally unnecessary. If Cary Grant and Joan Blondell had made this movie in the 40's; it would be a real "classic" for generations. Would not have wanted my 13 year old to see this movie - in spite of what is said in the real world. Love this.. I needed to laugh. Tiffany and Kevin along with each and every cast..amazing chemistry..super funny..
Not funny. I expected better. Dont waist the money. U would laugh more if u read a chapter of a joke book! This movie is not funny at all and not a great script. Could have been better. Comical from start to finish. Another hit from Kevin Hart. 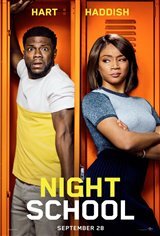 Tiffany Haddish was great in this partial serious role as a teacher. It was very funny and touching.